Since 1987, the designers and fabricators at Elite Design Cabinets, Inc. have been providing luxury kitchens and baths throughout Southern California. Elite Design Cabinets is a vibrant, trend-setting business that works with homeowners, architects, interior designers and builders to create the perfect environment. Whether it's a brand new, state-of-the-art contemporary kitchen, a top to bottom refresh of a beloved traditional design, or a modest makeover of existing cabinets and counter tops, Elite Design Cabinets has the skill, artistry, and experience to make any vision a reality. From concept to custom construction to installation, Elite Design Cabinets can help upgrade any kitchen, bathroom, office, theater, or other room with high quality, custom-constructed cabinets, granite or marble counter tops, and top of the line appliances, while staying on time and within budget. 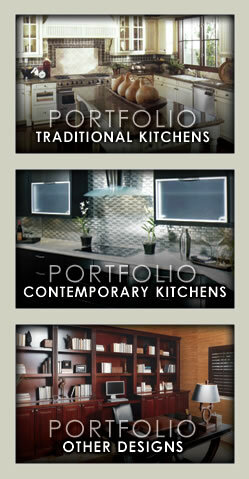 When it's time to make dreams come true, let Elite Design Cabinets lead the way. CA LIC # 966543 - Copyright © 2019 Elite Design Cabinets. All Rights Reserved. Duplication of any portion of this site is prohibited.